This past fall, the folks at the Edmonton Bicycle Commuters Society learned that BikeWorks South, a fixture of the cycling community located just off Whyte Avenue for more than a decade, would have to say goodbye to its old home. 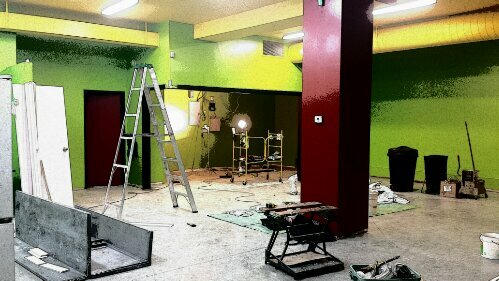 This means that much of the responsibility for finding and renovating a new space falls on my shoulders. For the purposes of this blog, it has meant that I’ve been too preoccupied to update it, in case you were wondering where I’ve been. It’s exciting times, and every step of the way has brought new challenges and lessons. It’s an opportunity to build a better BikeWorks: more accessible, no more alley entrance or navigating through a bike pile to get in, store front, windows! Around the same time that we were scrambling, looking for a new space, one of the coolest video stores in town was, unfortunately, going the way of the video store. Videodrome’s end was a sad moment for supporters of local, independent businesses but marked an opportunity for EBC, and we secured a long term lease on the space. 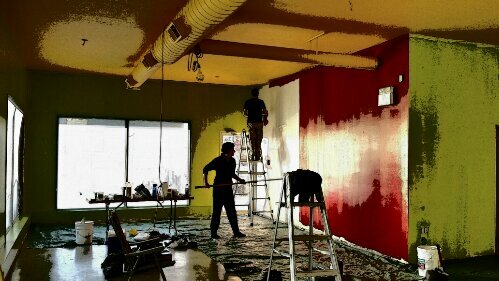 Next task: turn a video store into the best community bike shop on the continent (aim high). Considering I have exactly zero experience in renovations, this was going to mean a crash course in everything from ceiling to floor in order to scale a learning curve with the profile of a cliff. Luckily, there are many knowledgeable volunteers who’ve stepped forward to help out and show us how to do things right as the bulk of the work is being done by volunteers with experience ranging from none to extensive. …windows on three sides, and a whole lot of open space. I’d never noticed the windows when it was the Videodrome as there was shelving blocking it. They’re glorious! 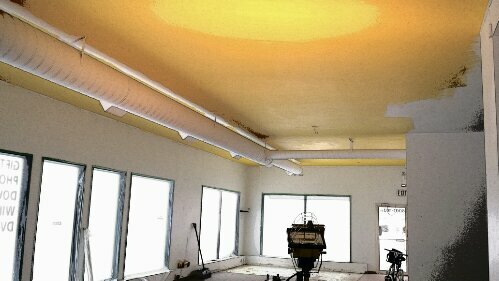 First step, paint the ceiling and ductwork yellow. This was especially urgent as it was a dirty pastel pink. Next, tear up the carpet and the counter ruins and scrape the carpet adhesive. We started with floor scrapers but after a whole day’s work by a small army of volunteers, we’d only cleared a small portion of the floor. 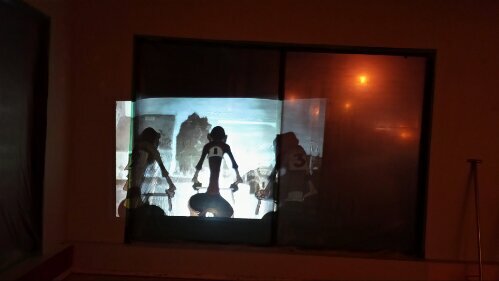 Time to bring in the heavy machinery, but first, a screening of Triplets of Bellevue on the translucent plastic protecting the windows. 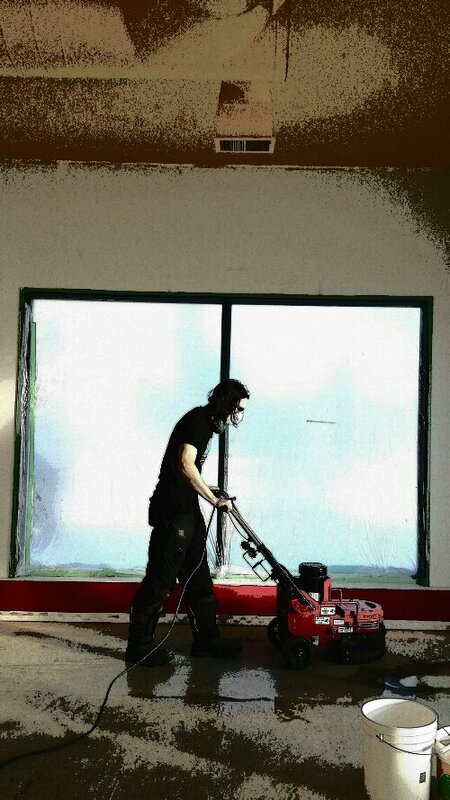 We brought in a floor grinder to obliterate the stubborn carpet adhesive and polish up the concrete. It was still a tonne of work grinding and then cleaning up the 250 pounds of sand it took to remove the glue. The concrete had to be clean enough to eat off of when the sealer was applied. The tedious work was rewarded with richly patina-ed stone-looking floor. I must admit, though, that pushing around that piece of machinery was pretty fun. Painting came next. No meek colours allowed. 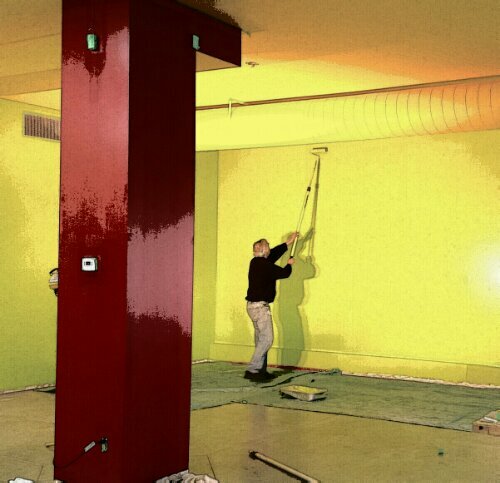 The colour scheme pays heed to our old shop and helps create a glowing, welcoming and energetic mood. 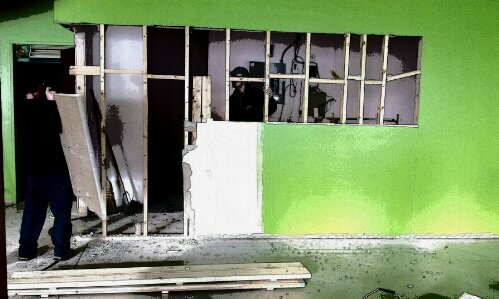 Thanks to some very committed volunteers, we lost the excess wall and gained a pretty and functional design feature. At this point, the space is really taking shape. 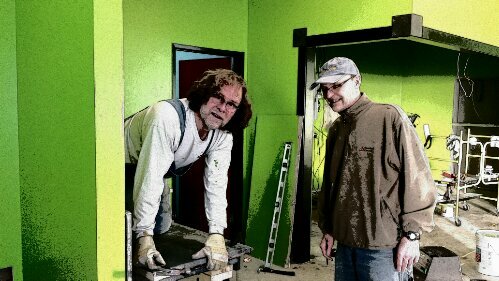 Don and Bruce have been integral to keeping the renovations on track and have already lent their decades of experience and hundreds hours of volunteer labour. Bruce salvaged steel countertop from a former Vic Comp science lab that they’ve turned into the parts washing and hand washing stations. The last week has been especially hectic because last Saturday was moving day. I was too busy directing the steady stream of volunteers bearing crates of parts and tools and other what-nots to take any pictures, so you’ll have to be satisfied with these before and after panoramas. (Click on the picture to enlarge.) At least the weather cooperated with a spring-like January day. Yep, there’s enough stuff to set up a community bike shop in that mess. The wheels and bikes will come after we get a handle on the storage situation for everything else. This story is still in progress and I learn something new every day. 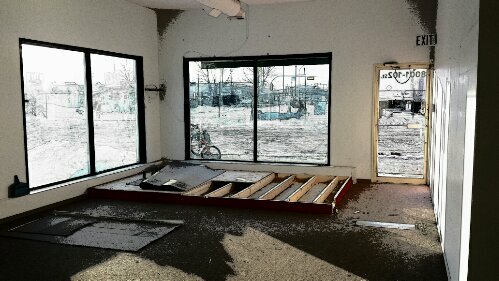 I keep getting more excited about the new shop and all the possibilities. There will be more repair stations and more space to work, we have a really cool bike storage system in the works, the place will be bright and accessible, and that’s just the tip of the iceberg. 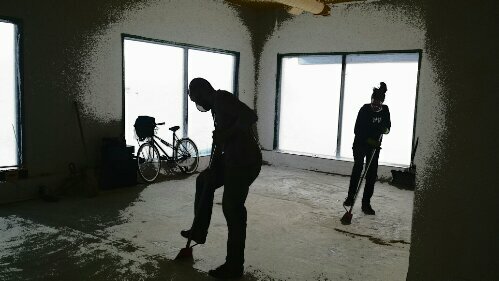 For many of the volunteers who helped with the move last weekend, it was the first time they had seen the new BikeWorks South. The reactions were fantastic and the enthusiasm contagious. 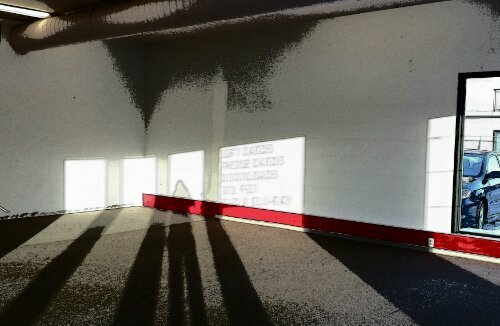 March, when we plan to open our doors, is not so far away. 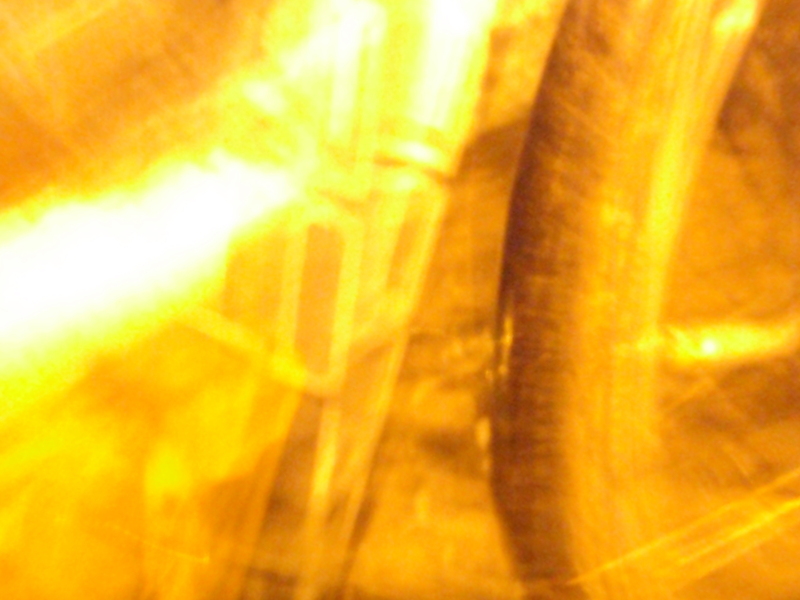 I was a young child when all the street lights were switched from the bluish metal halide to the yellow-orange high pressure sodium bulbs, but I still remember the change that gave a literal sepia tinge to most of the subsequent nights of my life. Those ubiquitous yellow street lights have also coloured the many night time posts of this blog, and it feels ironic to finally find the beauty in something that I always thought was an urban blight. 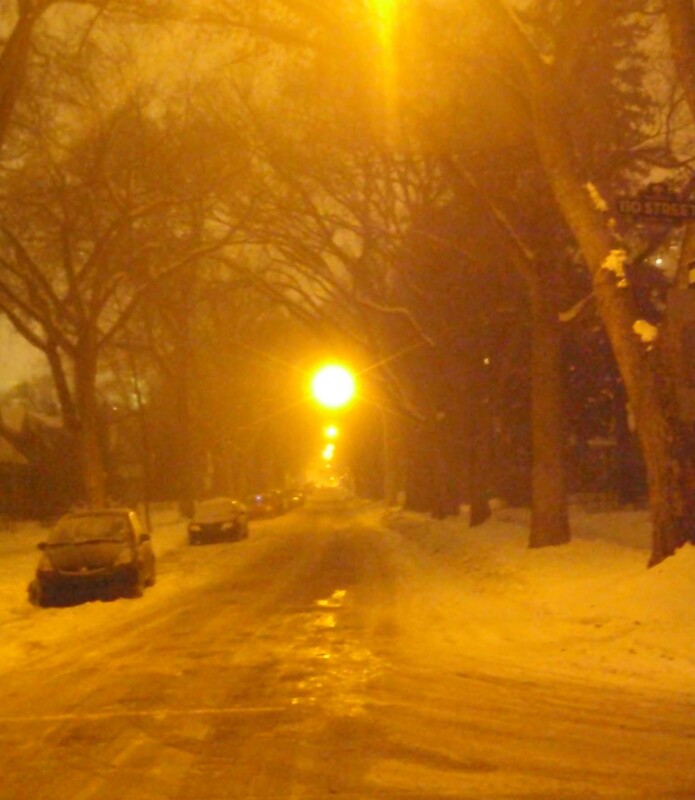 I love my neighbourhood, especially the elms, not so much the ice. 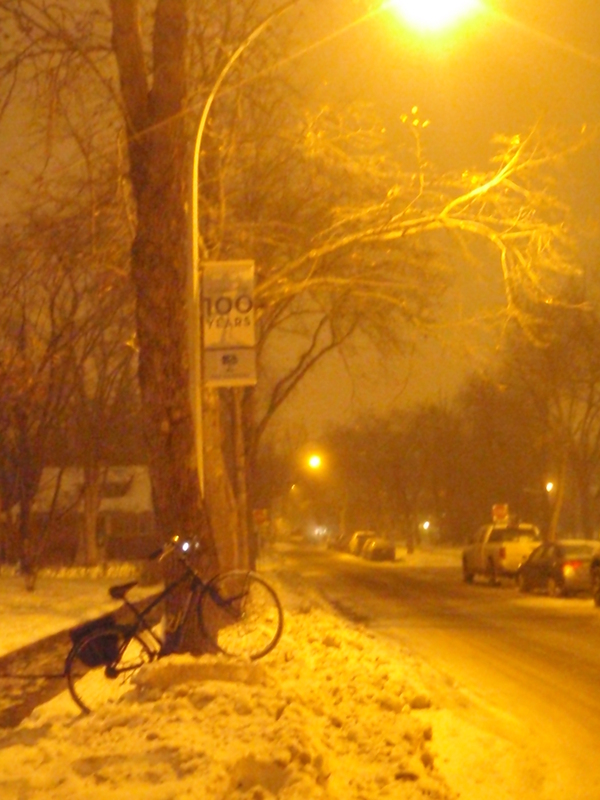 A bike, snow bank, and a wintery street scape. 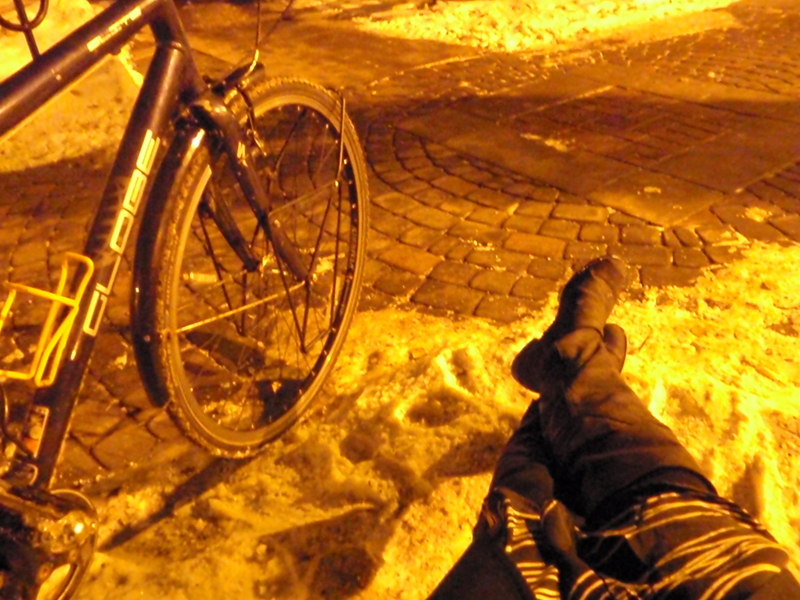 …forged in the sepia glow, like living nostalgia of the simple act of sitting on bench, by a snow bank, drinking tea. Sodium lights are on their way out, and cheaper, whiter, more efficient LED’s are starting to replace them. It won’t be long ’til the golden glow of a long winter’s night is replaced by a new hue and nostalgia for the old. I wonder how it will change how we see and act in the night.